My last entry in the Guess What S.C. town? series was clearly too easy. Let's see if anyone recognizes this spot. 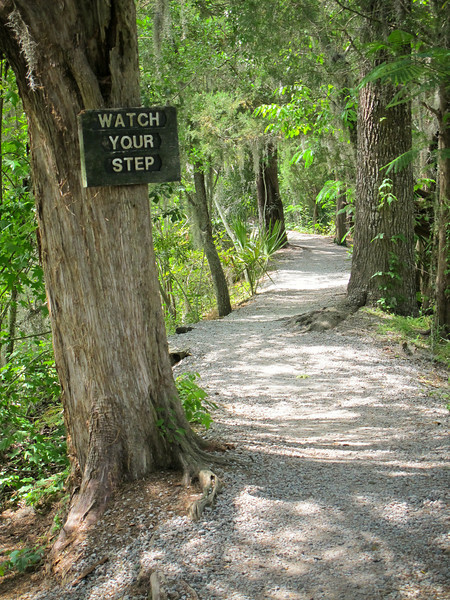 You'd have to be very familiar with back roads because I had to check the next sign to figure out where I was myself. 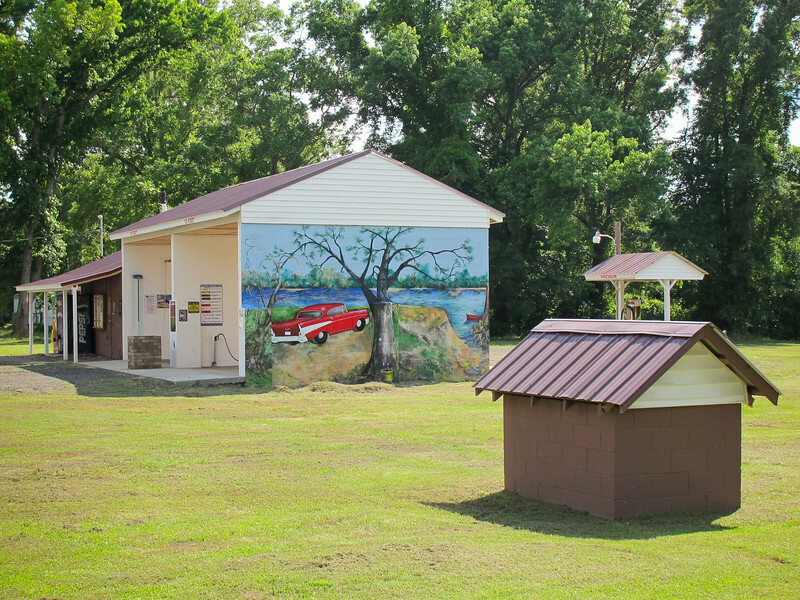 The cool mural was painted on the sign of a car wash. 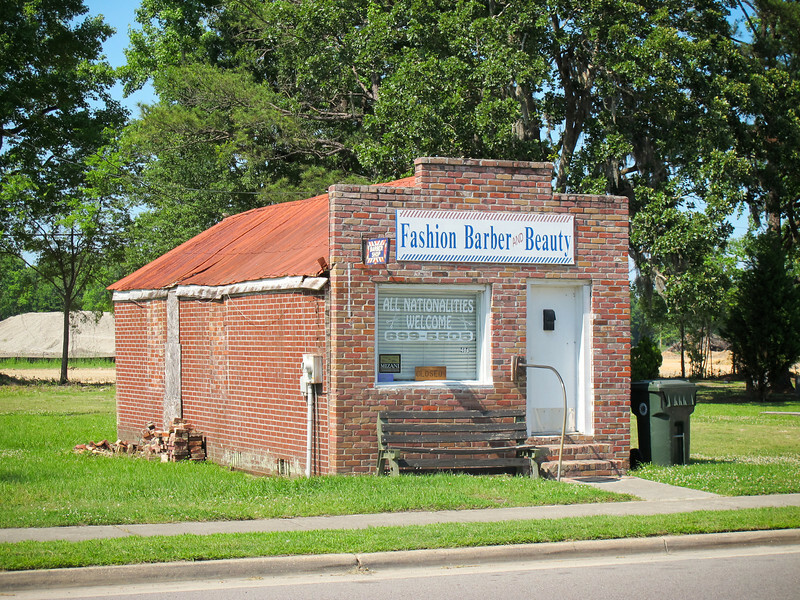 Fashion Barber & Beauty, S.C.
Let's see who knows their small towns in South Carolina. Where is this tiny Barber & Beauty Shop? Not that it matters. There is probably one just like it in every small town in South Carolina. Labels: Guess what SC town? Sergeant Jasper, Colonial Lake, Charleston, S.C.
Fourteen flours high counts as a sky scraper on the Charleston peninsula but we got used to it. Built in 1950 it is considered at the end of it's usable life. Now the Beach Company is hoping to rezone the area and will probably demolish the Sergeant Jasper apartment building. 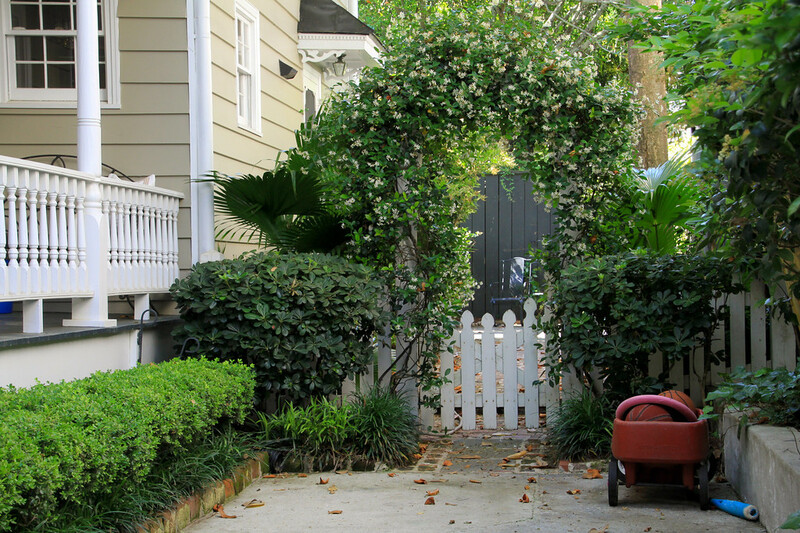 Susan Cohen at the Charleston City Paper reports on the discussion of the six acre area might be used for. 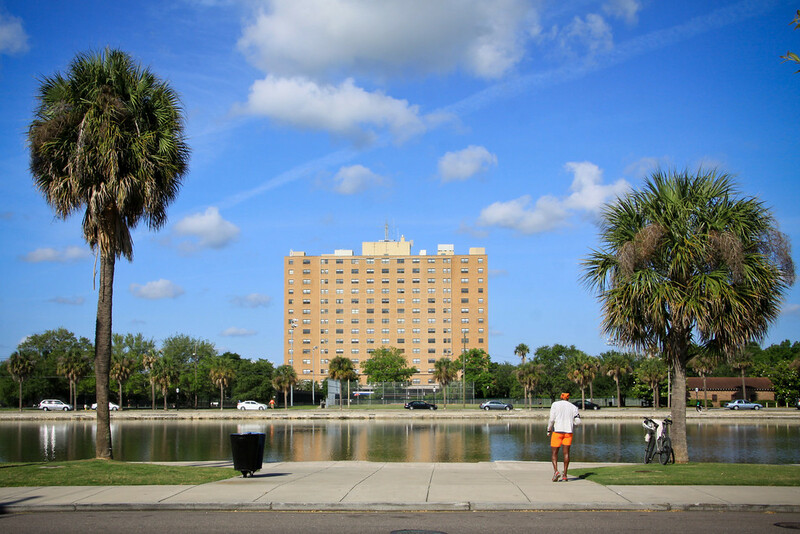 As it stands today, the big, brown Sergeant Jasper apartment building on Lockwood Boulevard (or Broad Street, if you'd like) shoots up 150 feet into the Lowcountry air. It has 14 occupied floors, plus two additional floors for mechanical equipment. There is also 17,000-square-feet of commercial space leased by doctor's offices, insurance and financial planning companies, and a minimart, while a mix of college students, MUSC nurses and interns, young urban professionals, and retirees live in the 221 one- and two-bedroom units. And these are very, very small apartments. 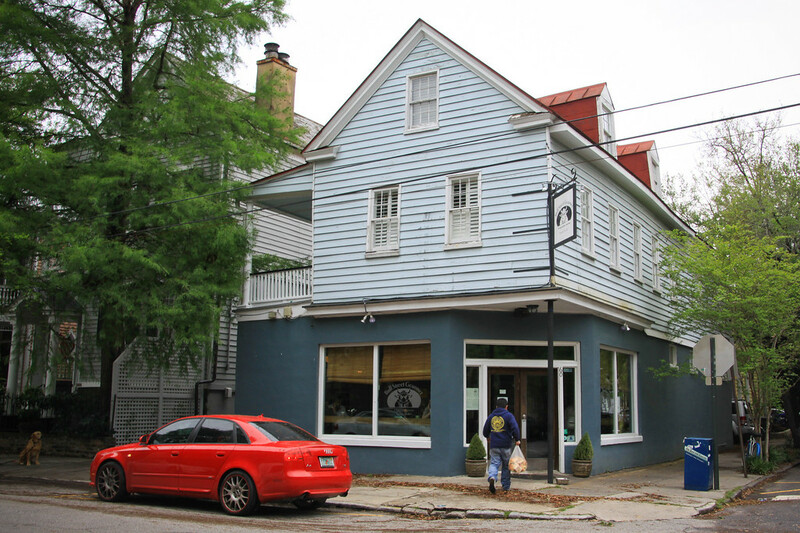 "If you want to have a refrigerator, you have to put it in your closet because there's not room to put one in your kitchen," explains Kent Johnson, vice president of the Beach Co., which owns the Sergeant Jasper. The pipes for the plumbing systems are so small that the units can't have garbage disposals or dishwashers. And the whole place smells a little funny. 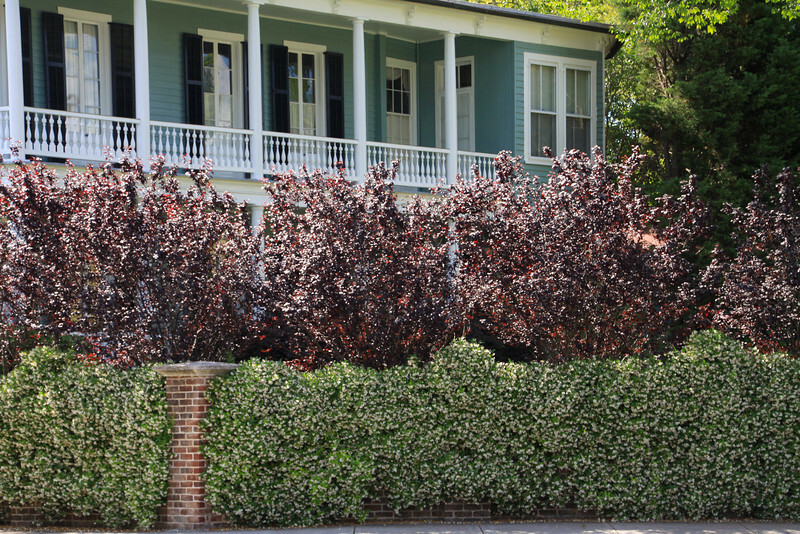 If those walls could talk we might have an interesting book about Charleston. Each former tenant could write a chapter. I like to throw in a bonus shot with a cool automobile for Lowandslow. That usually earns me a comment! 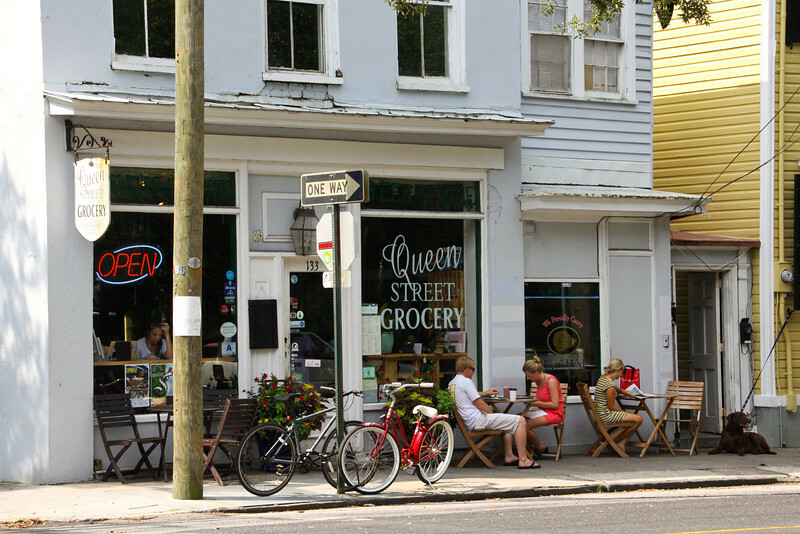 Caviar & Bananas, George St., Charleston, S.C.
Gourmet grocery stores! 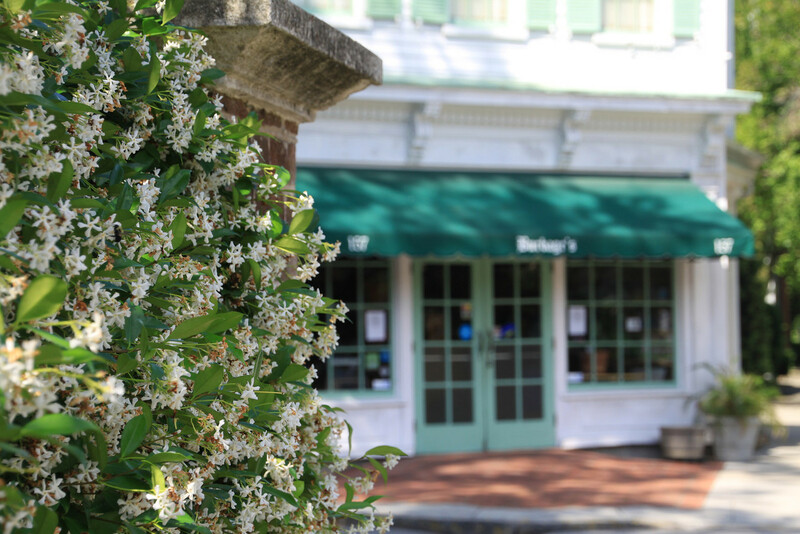 Delicious treats where you can have a table for one and get a great meal and a glass of wine on a walk. Oh yum. This shot was taken at Caviar & Bananas. No worries. I left with a Duck Confit sandwich for a picnic. Stop the press: I just noticed there are a few more days for their 5 for 5 Menu that goes through May. 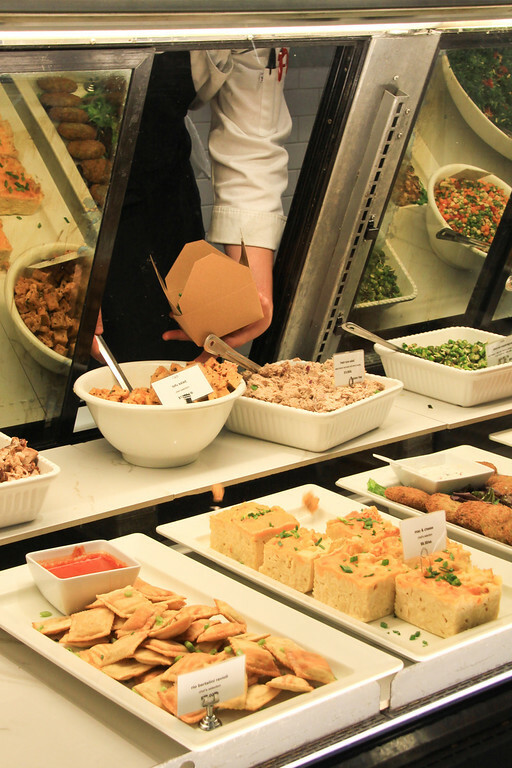 Labels: Caviar and Bananas, George St. I couldn't resist passing on this wonderful photograph and bit of history that was being shared on Facebook. I have never seen this picture before. 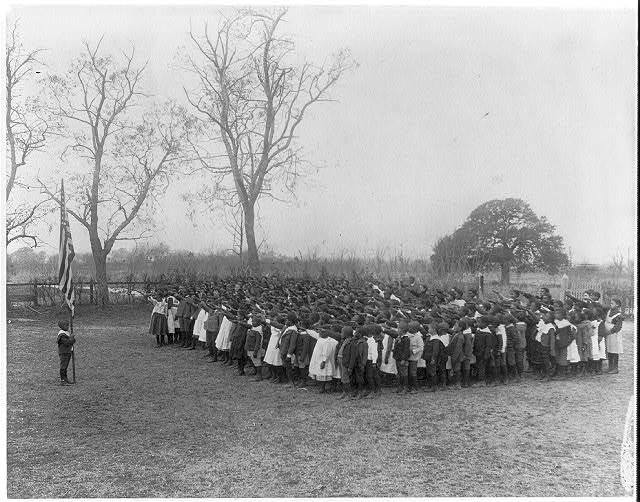 "According to Professor David Blight of the Yale University History Department, the first Memorial Day was observed by formerly enslaved black people at the Washington Race Course (today the location of Hampton Park) in Charleston, South Carolina. The race course had been used as a temporary Confederate prison camp in 1865 as well as a mass grave for Union soldiers who died there. Immediately after the cessation of hostilities, formerly enslaved people exhumed the bodies from the mass grave and reinterred them properly with individual graves. They built a fence around the graveyard with an entry arch and declared it a Union graveyard. The work was completed in only ten days. 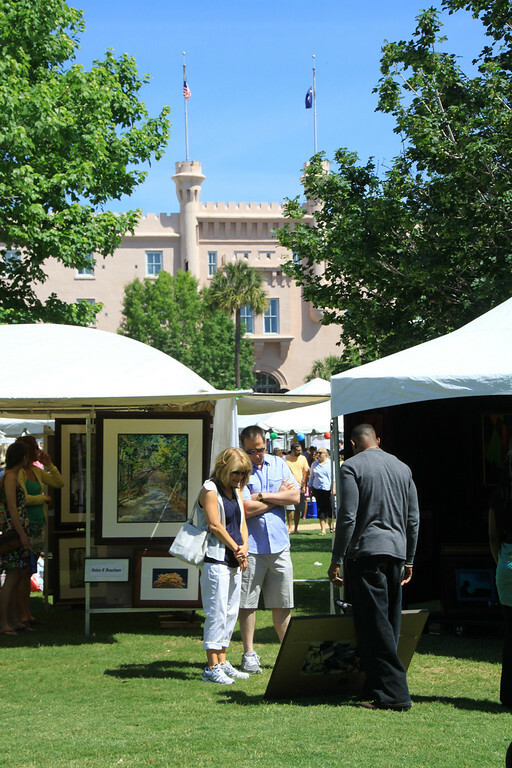 On May 1, 1865, the Charleston newspaper reported that a crowd of up to ten thousand, mainly black residents, including 2,800 children, proceeded to the location for a celebration which included sermons, singing, and a picnic on the grounds, thereby creating the first Decoration Day." Edit: I was informed that although the story is historically true the photograph is not from Charleston but a scene in Hampton, Virginia. 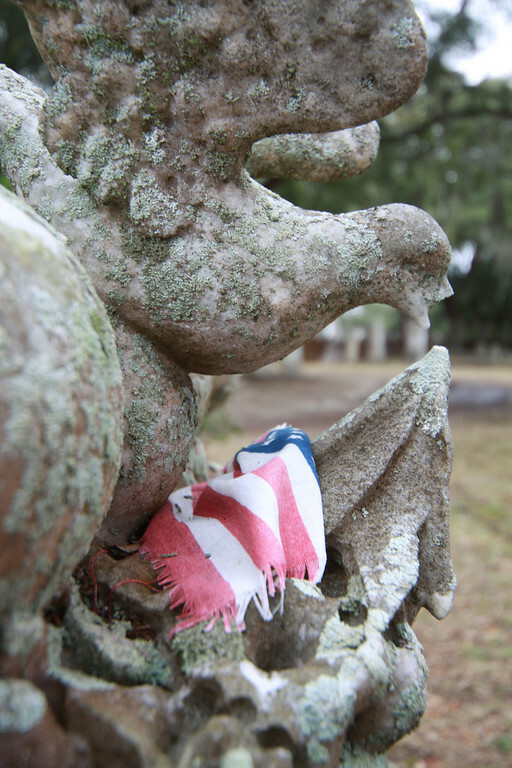 This link has more information on the beginnings of Memorial Day. 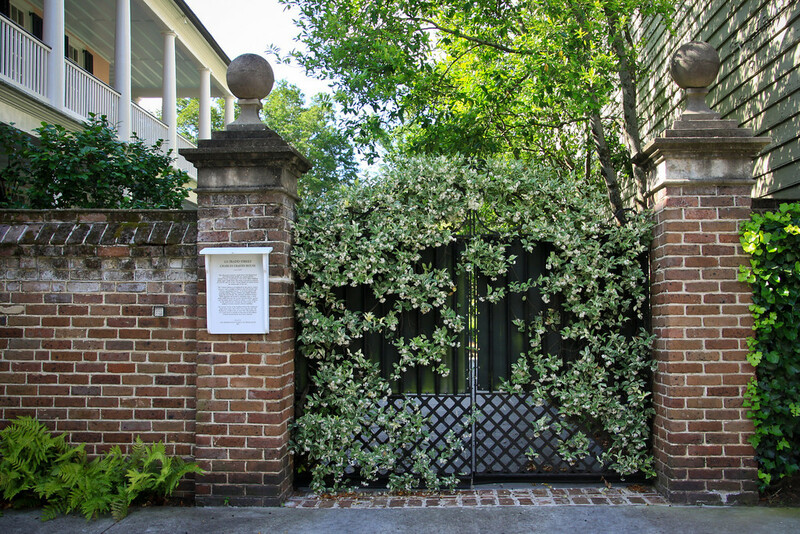 Confederate Jasmine Gate, Charleston, S.C.
Let's make a law that every homeowner in Charleston is required to plant Confederate Jasmine and azaleas. It won't pass, but how much more fun to argue about than the current bills up for discussion. I am stepping up and offering to be the Floral Inspector. 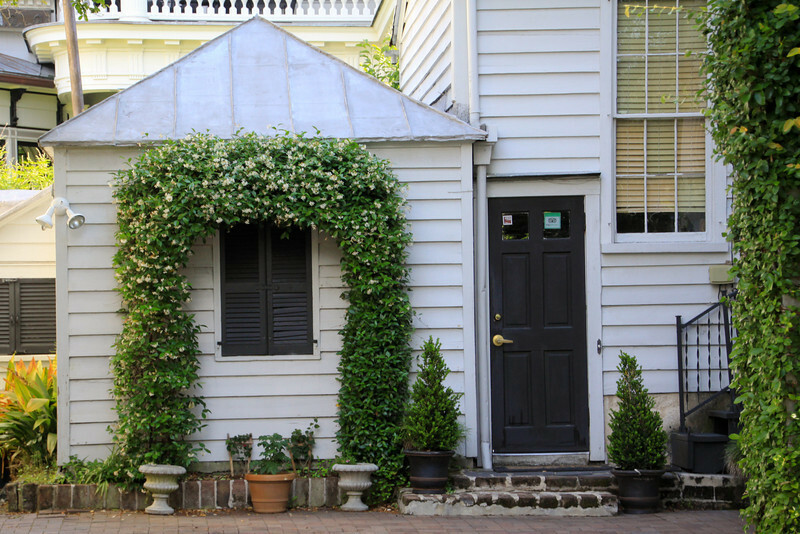 Welcome to Charleston. 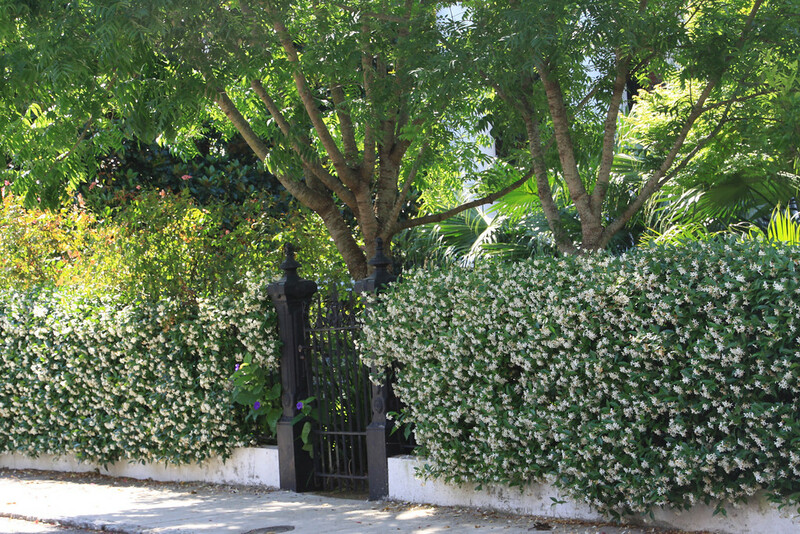 You will need to plant some jasmine. 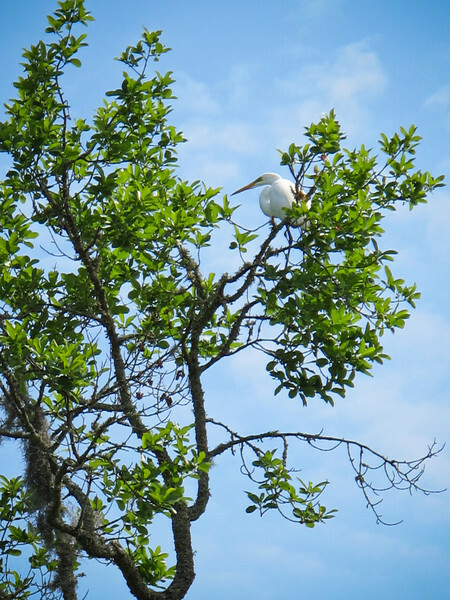 Thanks to these upstanding citizens who followed my unwritten rules for living in the lowcountry. I must be allowed to stay as well. I had my old garage covered in jasmine in town and although it isn't blooming yet, I have some started in my new nest. Memorial Day is a day of remembering the men and women who died while serving in the US Armed Forced. Formerly known as Decoration Day, it originated after the American Civil War to commemorate the Union and Confederate soldiers who died in the Civil War. By the 20th century, Memorial Day had been extended to honor all Americans who have died while in the military service.It typically marks the start of the summer vacation season, while Labor Day marks its end. Let's have a party Charleston! 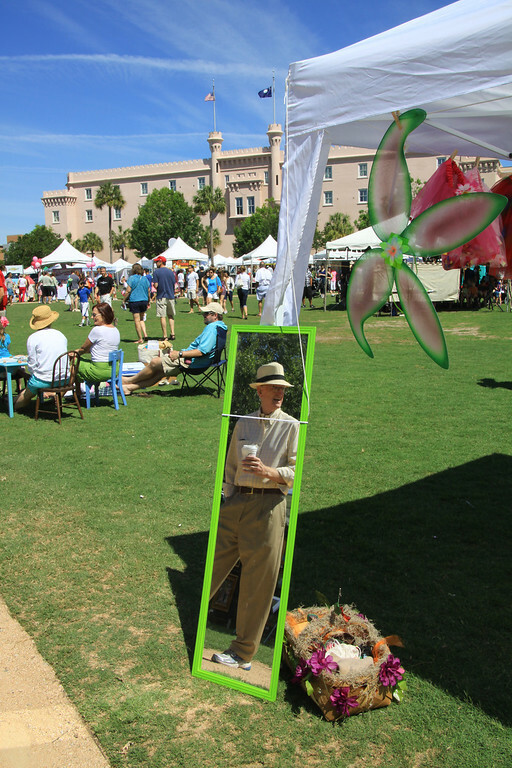 I walked through the crowded Farmer's Market and Piccolo Art Show at Marion Square this morning. I appreciated the gentleman who walked by the mirror in the shot at exactly the right moment. Perfect! He looks like a painting. I couldn't have planned it better. I've been so preoccupied with my nasty poison ivy covered body that I haven't made any plans for the long weekend except to slather on ointment and soak in my tub. Yuck. Y'all party on. I am the itchy scratchy wall-flower. 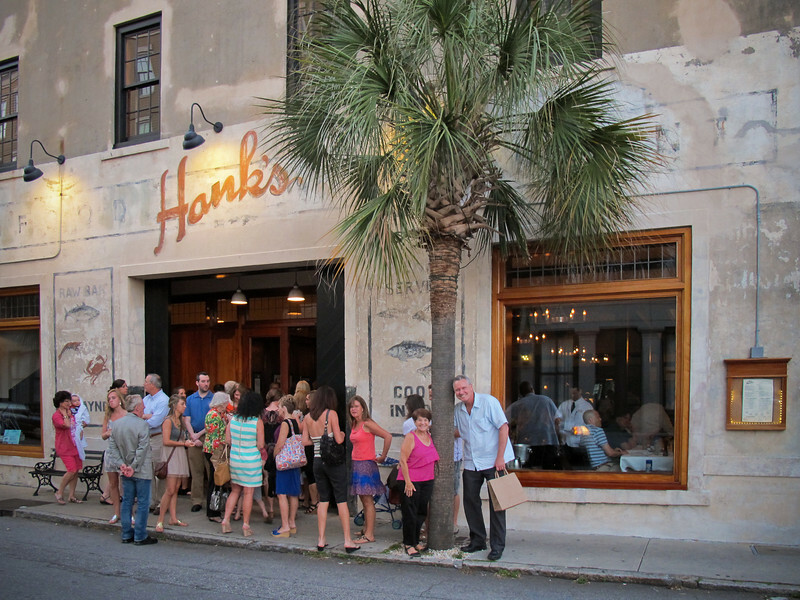 Hank's Seafood, Hayne St., Charleston, S.C. 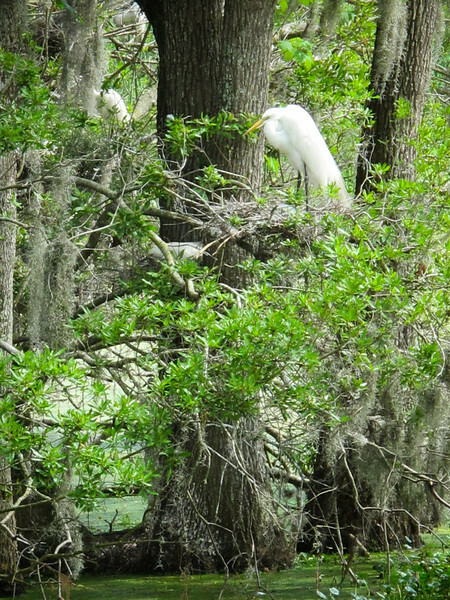 The two characters propping up the palmetto tree were with me. The moon was full and downtown was bustling with festive activity. 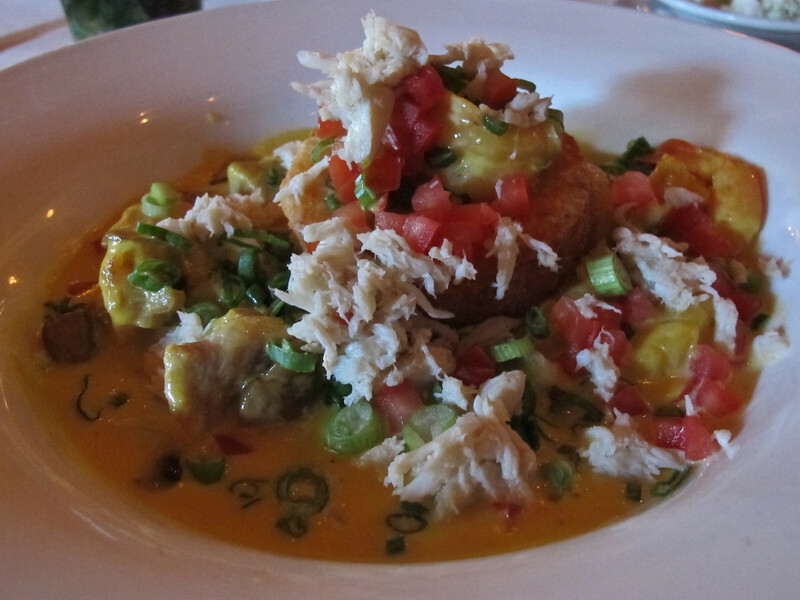 The Spoleto festival started today and I celebrated with Seafood A La Wando at Hank's Seafood. Nice sideline...one of the servers came up and gave me a hug. She used to be one of my hospital volunteers. I love knowing good people all over town. Red Cross donation site for the Oklahoma recovery relief. 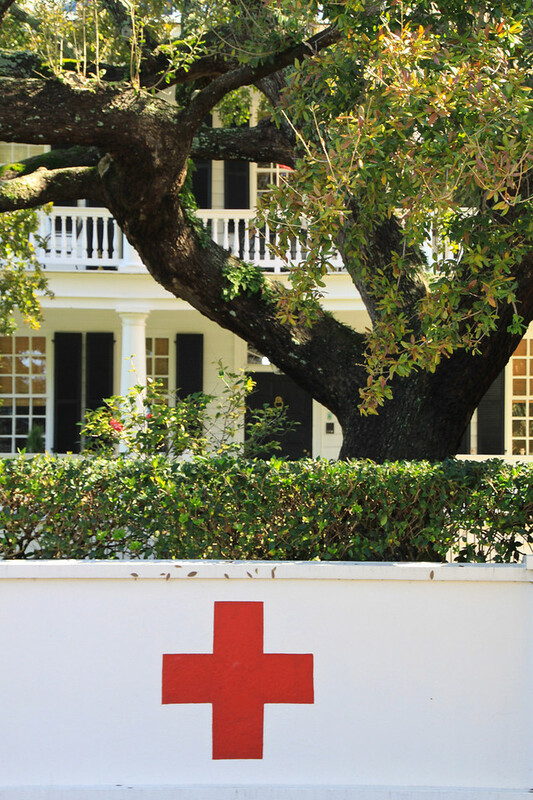 Today's bit of history: this Smith St. house that has the red cross painted on it was actually the local headquarters of the American Red Cross during World War I. 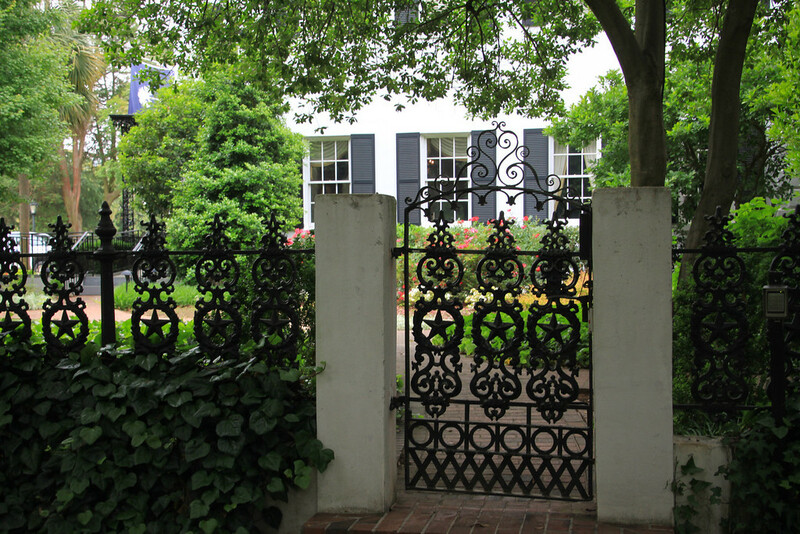 It housed the administrative services of the Red Cross as well as the Blood Bank until 1989 until it returned to being a family residence. Labels: Red Cross, Smith St. Waaaaa....I have a mess of poison ivy. Poor, poor pitiful me. I moved a tv into the bathroom and played one of the Doc Martin DVDs while I took a long soak to keep myself from scratching my skin off. Wish me luck. I keep telling myself, "at least it isn't smallpox." 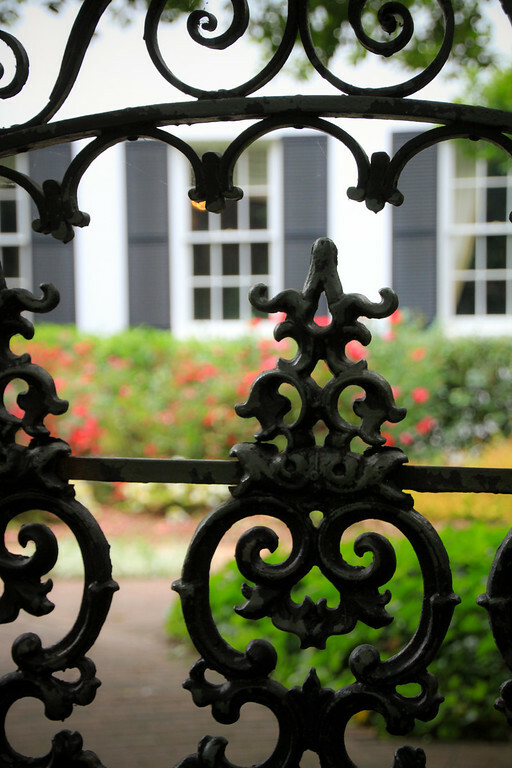 Today's picture is not from Charleston but was taken at the Governor's Mansion in Columbia. What beautiful delicate iron work. 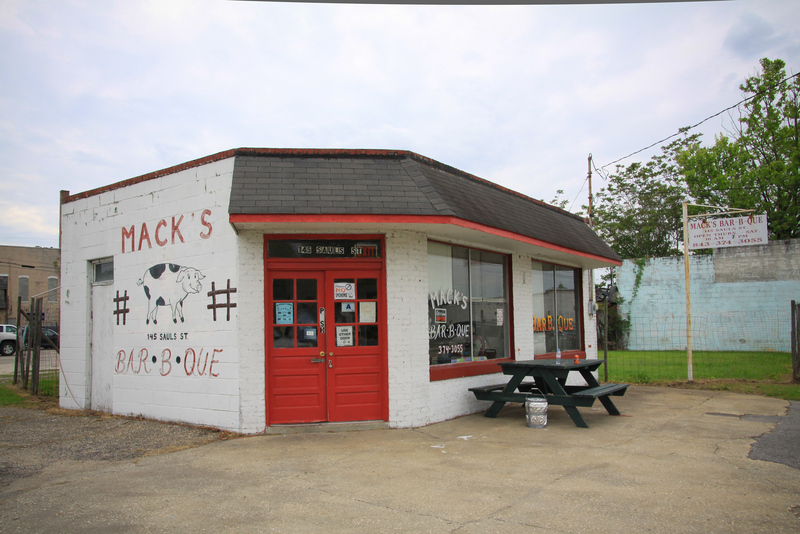 Mack's Bar B Que, Lake City, S.C. 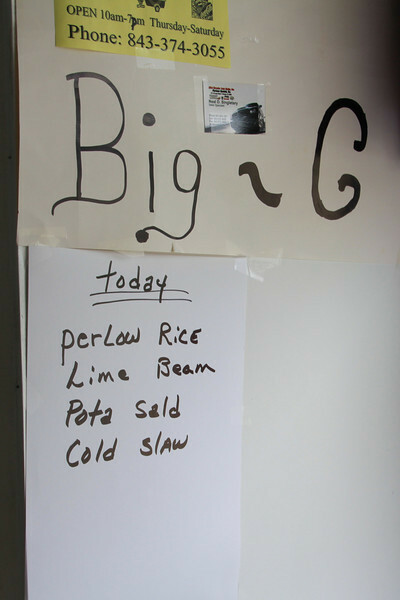 I took the picture for the Perlow Rice and then spotted the rest of the quirky spelling. I spotted this at Mack's Bar-B-Que when I was in Lake City a few weeks ago. Is it pilau, perloo. perlau, plaw, pilaw, pilaf, or pilaff? The word comes from the Turkish pilaw, from the Persian pilaw, and from the Osmanli pilav, "rice porridge." Pronunciation is just as varied, as in PER-lo, PEELaf, or per-LO. 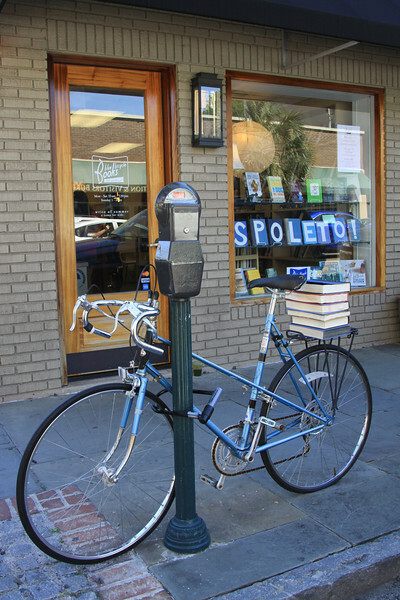 According to Bill Neal, Charlestonians, no matter how they spell it, all pronounce it PER-low. English writers spoke of the dish in the seventeenth century, and by the eighteenth century it had taken hold in Britain, especially after the empire spread through the Middle East and into India. 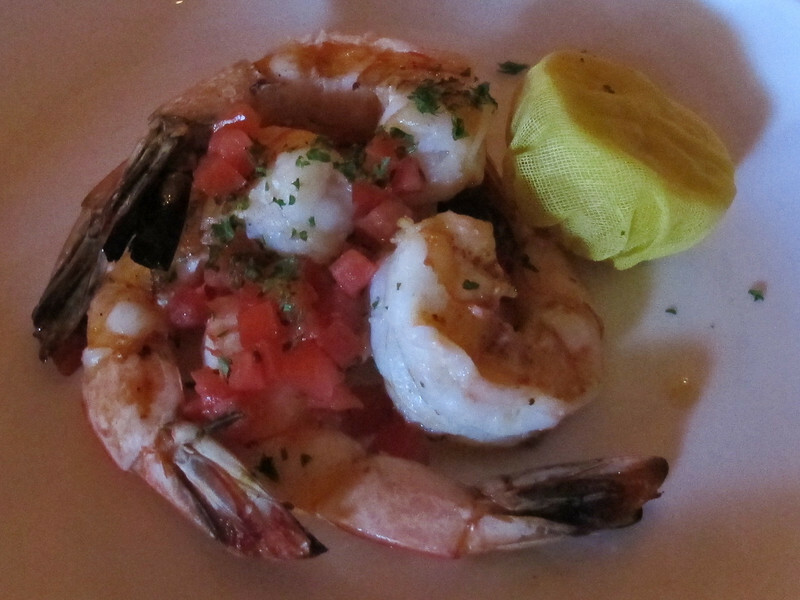 In America, the Southern rice crops and the influence of the spice trade made the dish popular. Pilau has been a popular dish in many Southern states for 300 years, particularly South Carolina, Florida, and Louisiana. It is the spring statement fashion Charleston style - stylish boots and short shorts. It was a bright sunny day, a bit warm for boots but considering all the little bites I have on my sandaled tootsies, she was dressed the smarter of us for stomping through the swamp paths. Thanks to Sheryl for posing for me as we passed on our hikes around the lake. 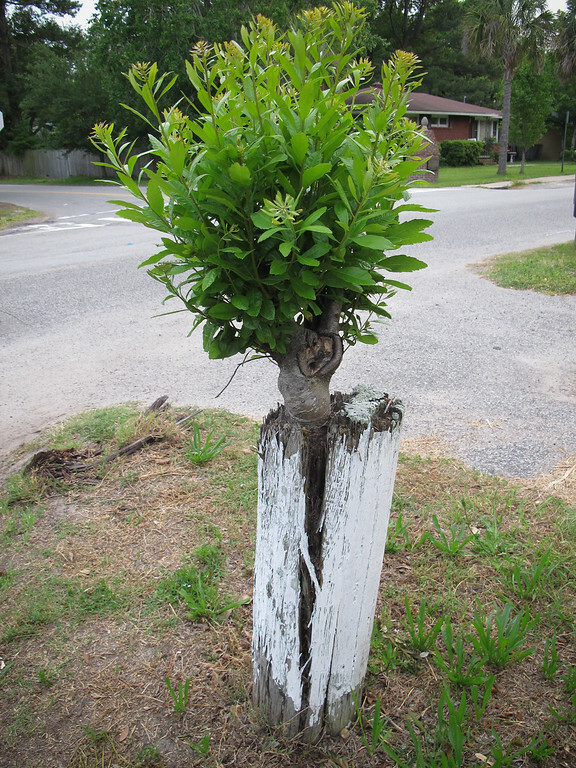 This may be my new favorite tree. Wow. The trunk is quite thick and sturdy so it hasn't just popped up. This is quite amazing. 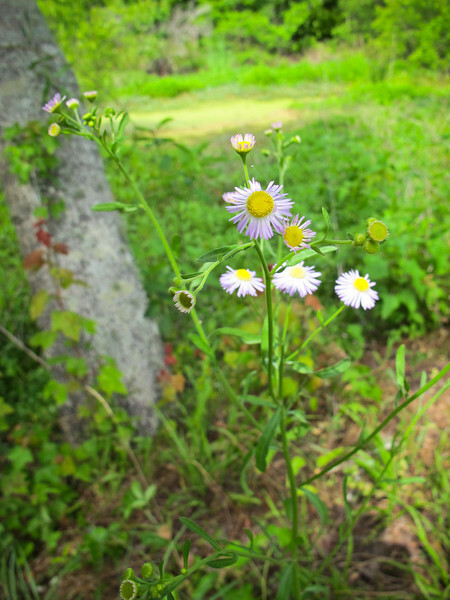 I found it in behind South Windermere when I walked down the greenway to try out the newly opened YoBo Cantina Fresca. 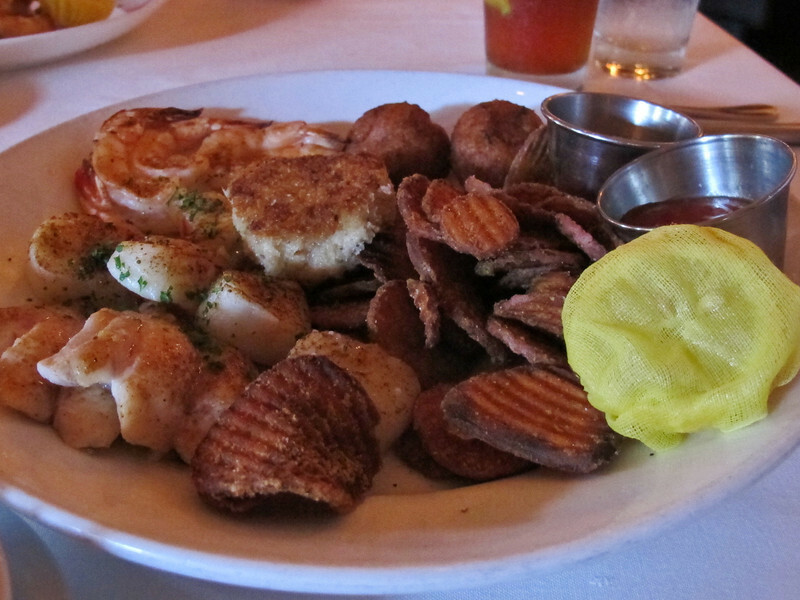 You know my theory, if you walk to and from dinner there are no calories to consider. Yummy dinner by the way. 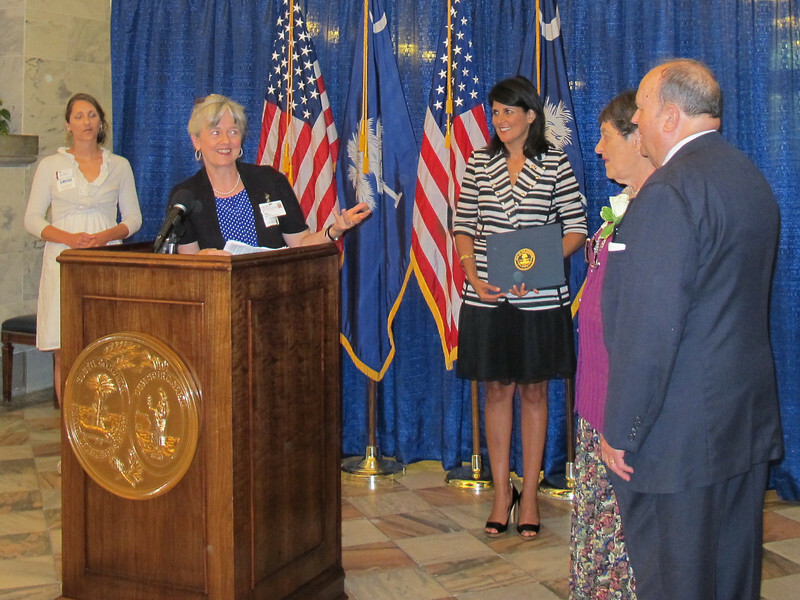 Thanks to the South Carolina Association for Volunteer Administration for coordinating the presentation of the 2013 Governor's Awards for Volunteerism at the Statehouse yesterday. 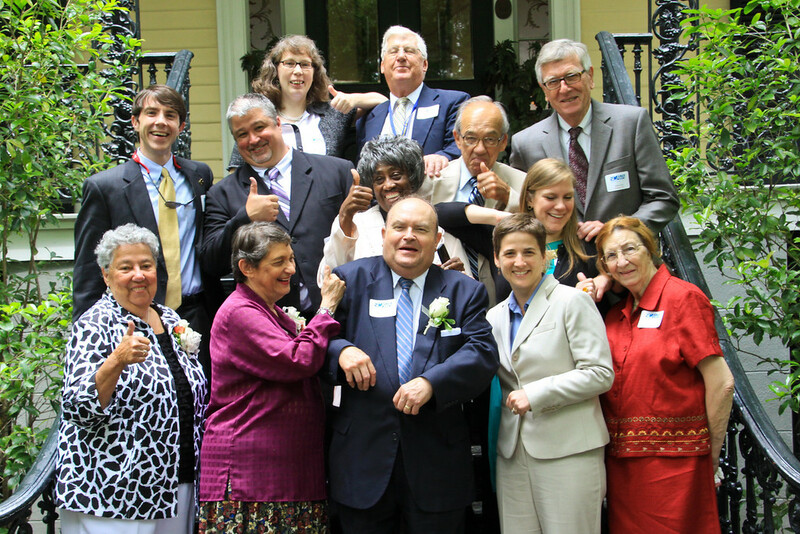 I had three nominees being honored so we took a happy gang to Columbia for the festivities. 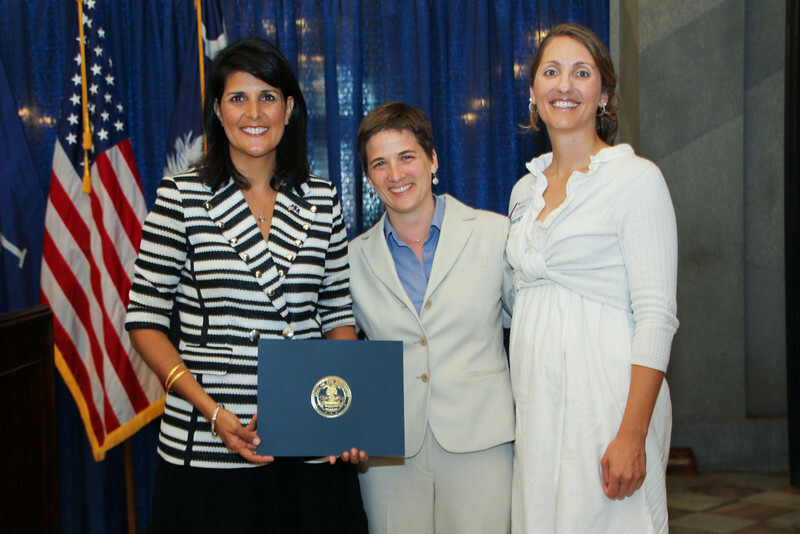 The awards presentation was held at the Statehouse with Governor Nikki Haley and then we went to the Lace House on the Governor's Mansion grounds for a luncheon. 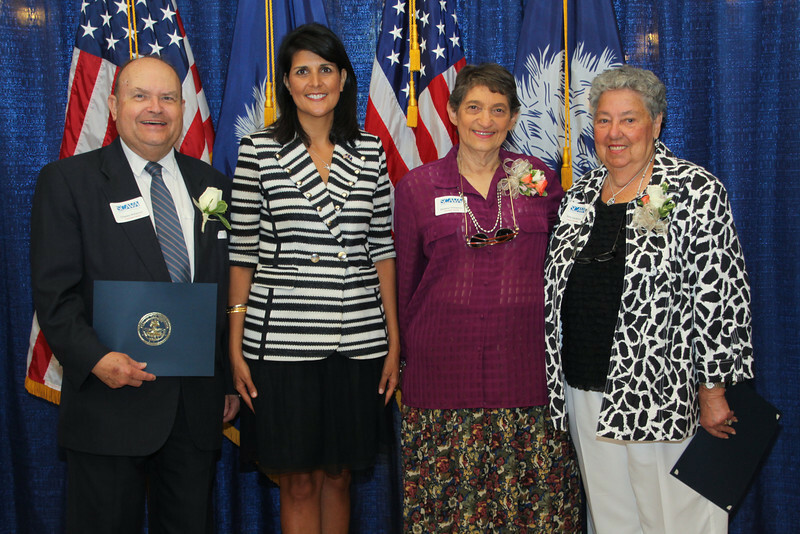 My winners from Charleston pictured below with the Governor are Charles & Marlene Williamon and Betty Saulisbury. Charles and Marlene volunteer for almost every non-profit in town (seriously!) and Betty has served close to 30,000 hours at Roper Hospital. 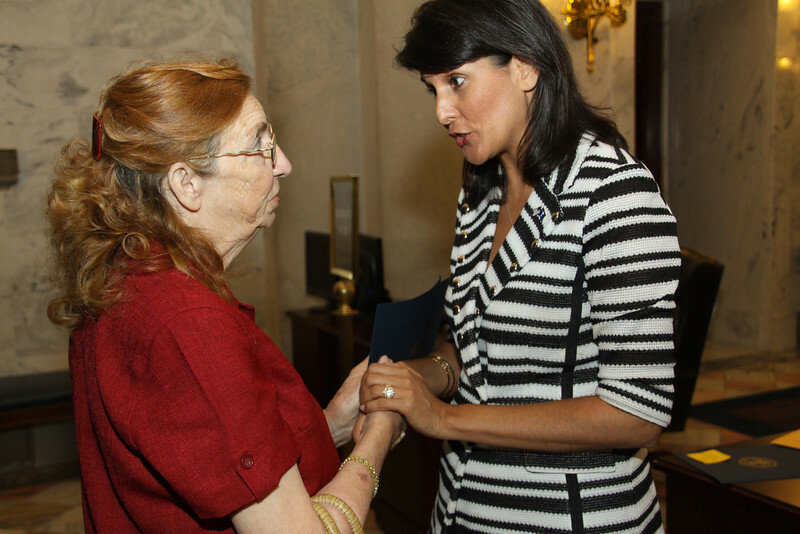 I've been going to this event for quite a few years and am so appreciative of Governor Haley for taking the time to make it such a special event. In the past, our Governors never even bothered to show up for the event. I served as photographer and handed my pocket camera over to a friend as I did my presentation. That is how I got in the final shot! Heheh. In recognition of Hospital Week I've pulled up a few pictures from a couple years ago. 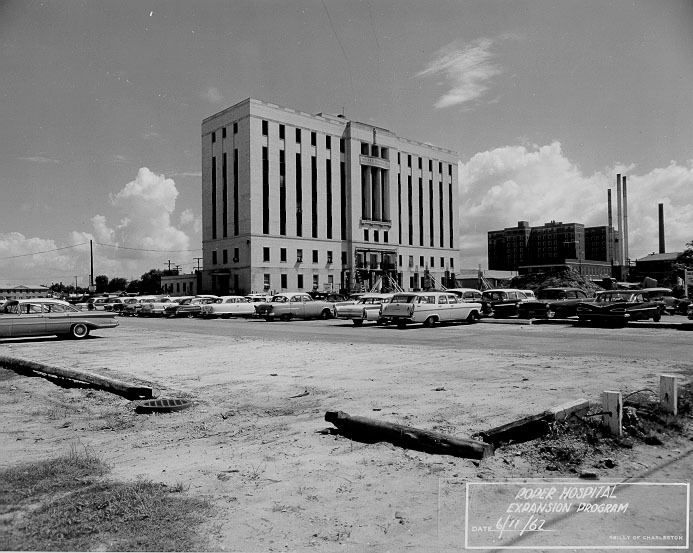 The Roper Hospital shot is from 1962. 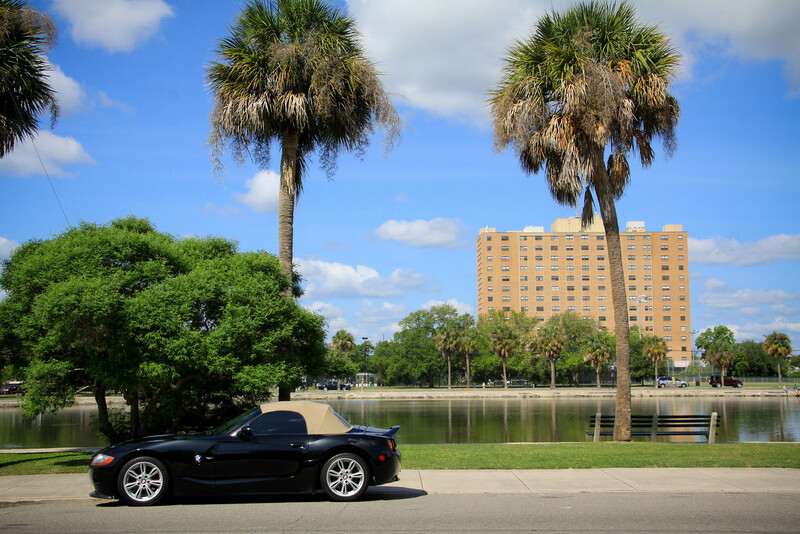 I love how the cars date the photo. So often I try to avoid having cars in a picture but they are an important feature of the period. The shot below is St. Francis Xavier Hospital at Calhoun and Ashley. The facade still appears to be there today covered by yellow brick. It was an attractive building. I used to help deliver babies in the third floor of that building - after it had been uglified. 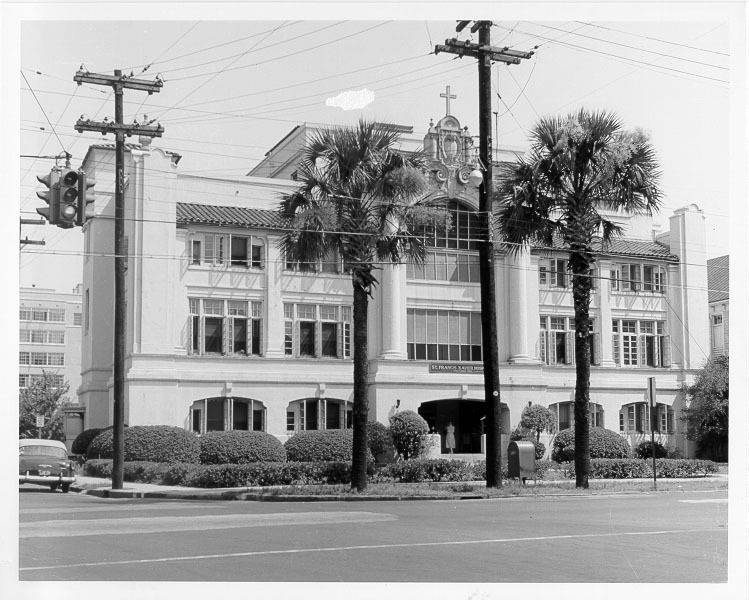 St. Francis Xavier Hospital, Charleston, S.C. 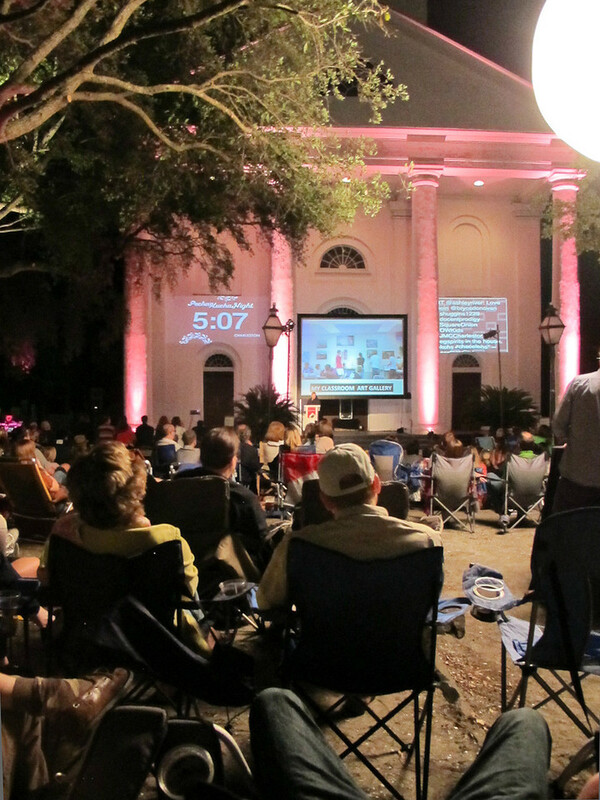 They couldn't have dreamed up a more perfect evening for the spring outdoors Pecha Kucha event.This session was held at Wragg Square in front of Second Presbterian Church. 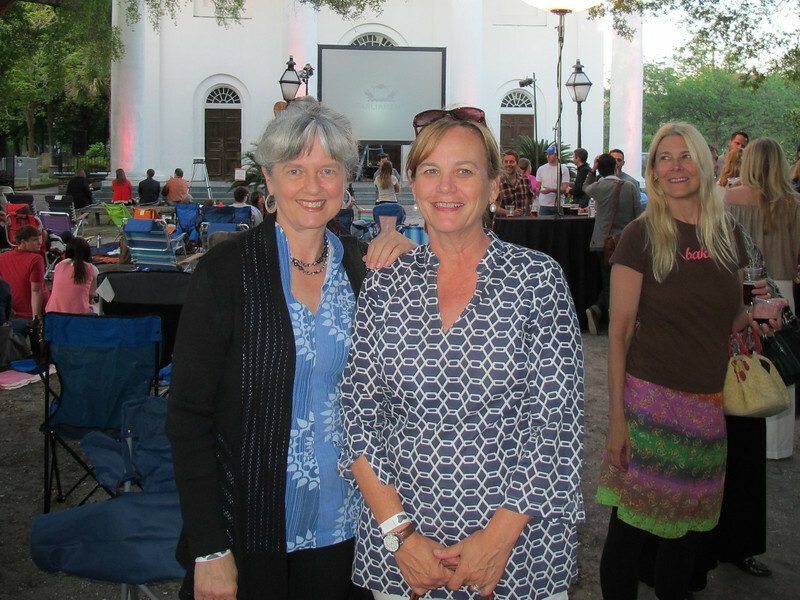 It was a glorious and perfect Charleston evening. I wasn't too sure about how long the lines might be for the pizza so I stopped at Publix and picked up picnic goodies. Pecha Kucha, Japanese for the sound of conversation, is a mix of show-and-tell, open-mike night and happy hour that has become a forum for ideas on design, architecture and other forms of creativity. Devised in 2003 in Tokyo, Pecha Kucha Night has spread virally to over 135 cities around the world as an informal forum for creative people to meet, network and show their work in public.For more about Pecha Kucha you can visit the global website. Each presenter is allowed 20 images, each shown for just 20 seconds, giving 6 minutes 40 seconds of fame before the next presenter is up. This keeps presentations concise, the interest level up, and gives more people the chance to show. Check here for this evening's presenters and sign up to be notified of the ticket sales and event schedule. 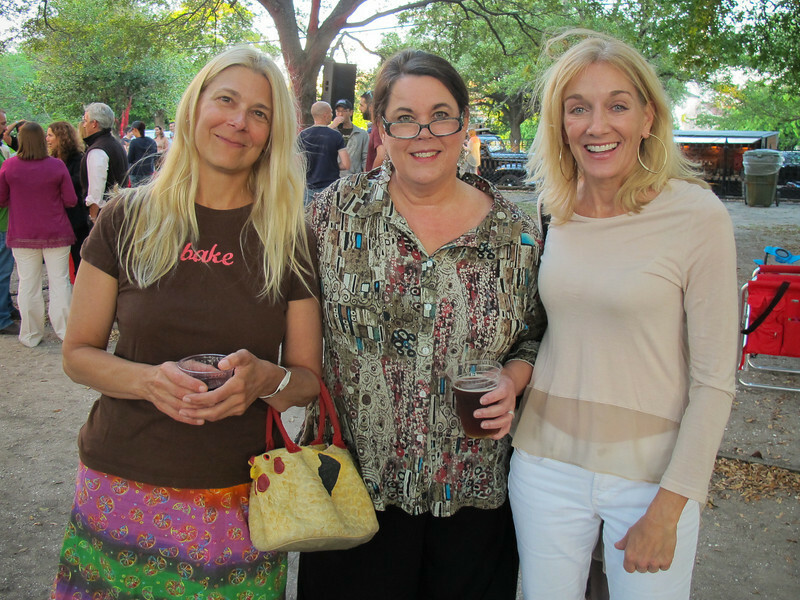 Thanks to our event coordinators for rallying the creative side of the lowcountry! 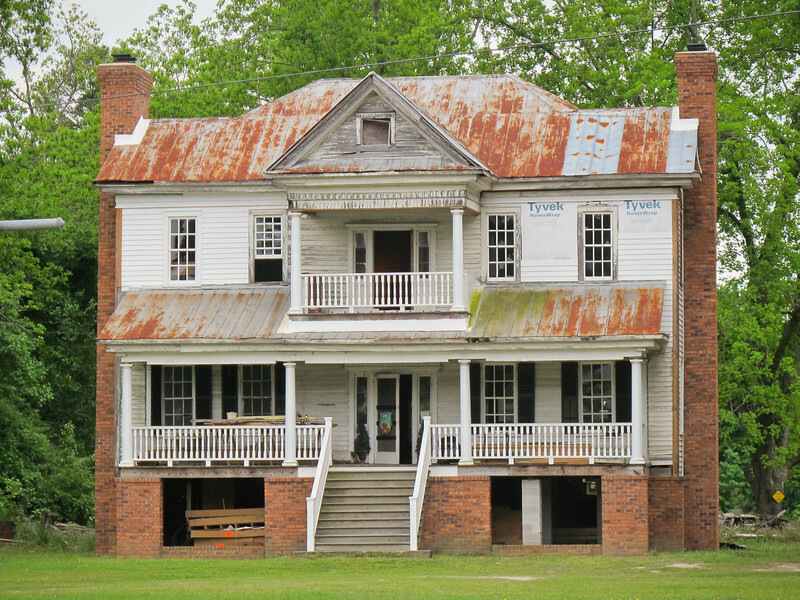 This beautiful old home is at the intersection in the unincorporated community of Wells, S.C. Everytime I pass that way I check on the renovation progress. I'd say it is slooooooow but steady. The picture below was taken in 2009. 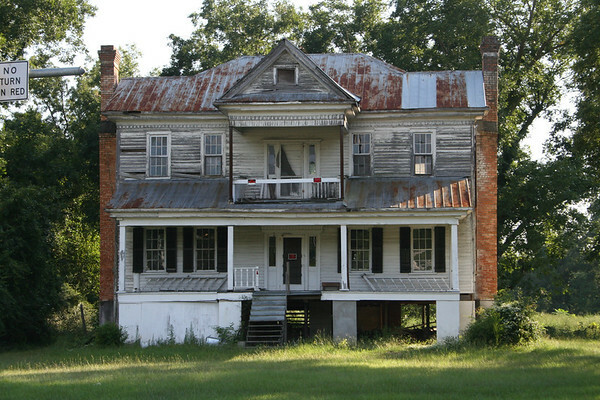 As I googled to see if I was the only person taking pictures of this home, I came across this site of Historic Homes for Sale in South Carolina. 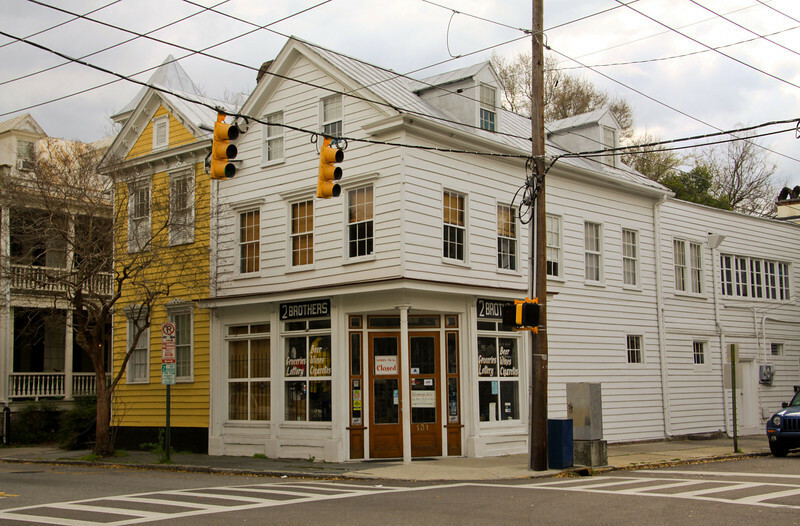 There are some real deals here if you don't mind living in tiny town, South Carolina. 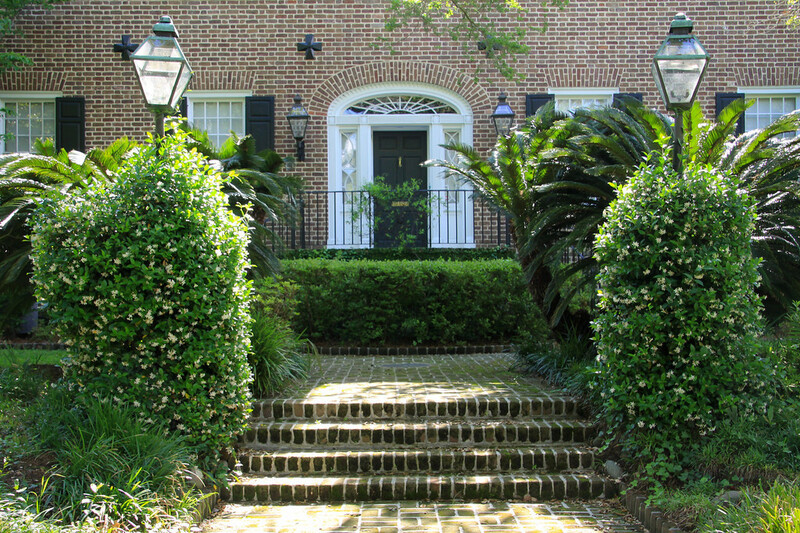 Check out this home in Clio, S.C. I took a picture of the same truck a year ago and it had an entirely different message that seemed full of anger. The artist seems to have had a more peaceful change of heart. World Peace. Who can argue with that? I hope everyone had a good weekend. As usual I have saved all of my chores for the last hour of my weekend. Wash is in, dishwasher running, bills getting paid while I watch the one night of good tv - Midwives, Selfridges and Mad Men. 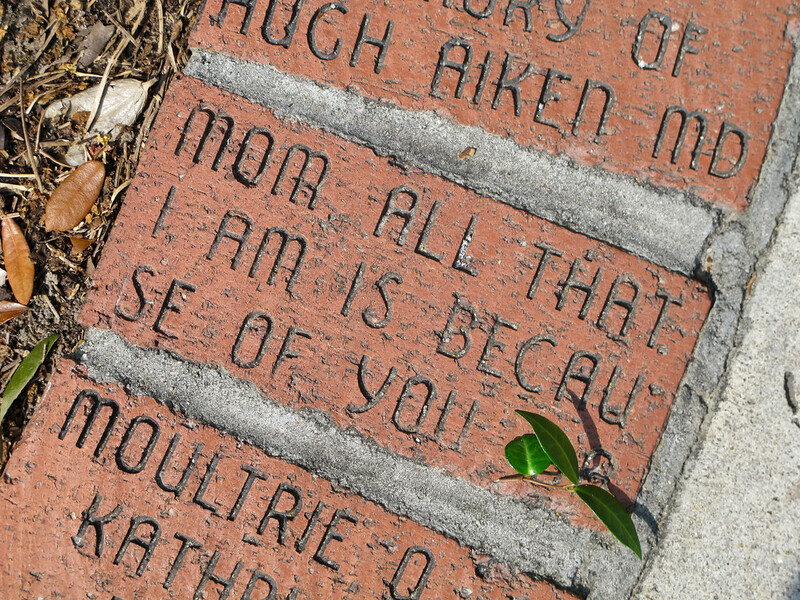 Mother's Day message, Charleston, S.C. Mom, All that I am is because of you! I carefully placed the leaf to cover the initials and pretended it was from my kids. Heheh. Here is the link to the original. If your initials are "BA" print it out and frame it for your mama. 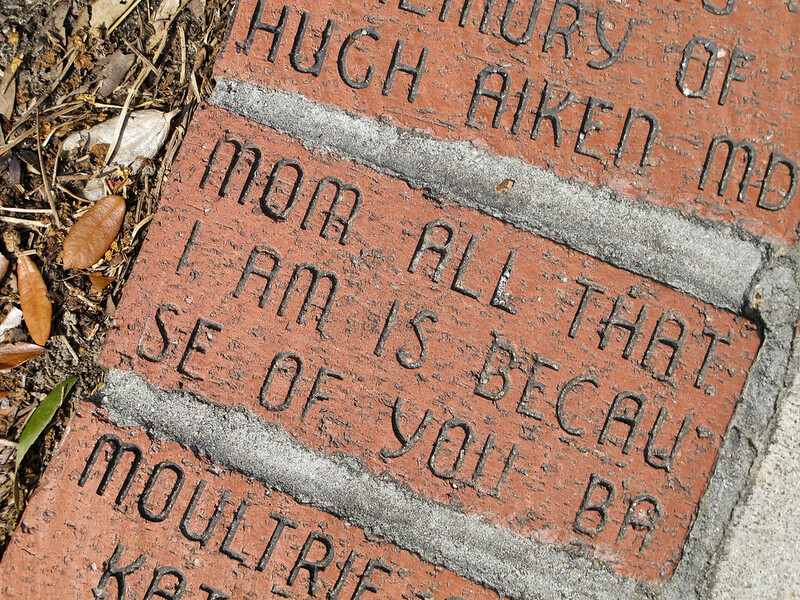 I found this on the walk-through short cut between Rutledge and Ashley Ave. on MUSC territory. Sweet. Folly Beach boat, Folly Rd., S.C. 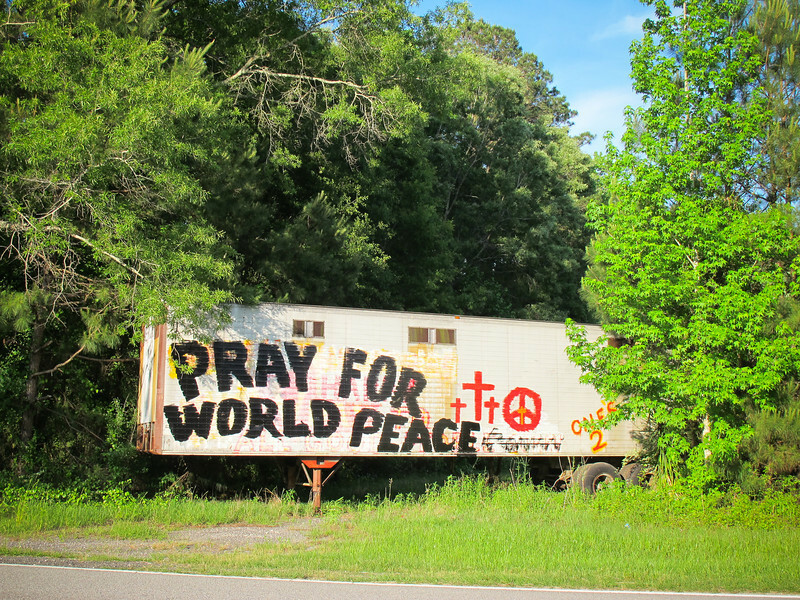 It is the public bulletin board on the side of the road heading to Folly Beach. The abandoned boat washed up by hurricane Hugo winds has been painted so many times I am sure it is the paint that is holding it together. The boat is fair game and anyone can paint it. 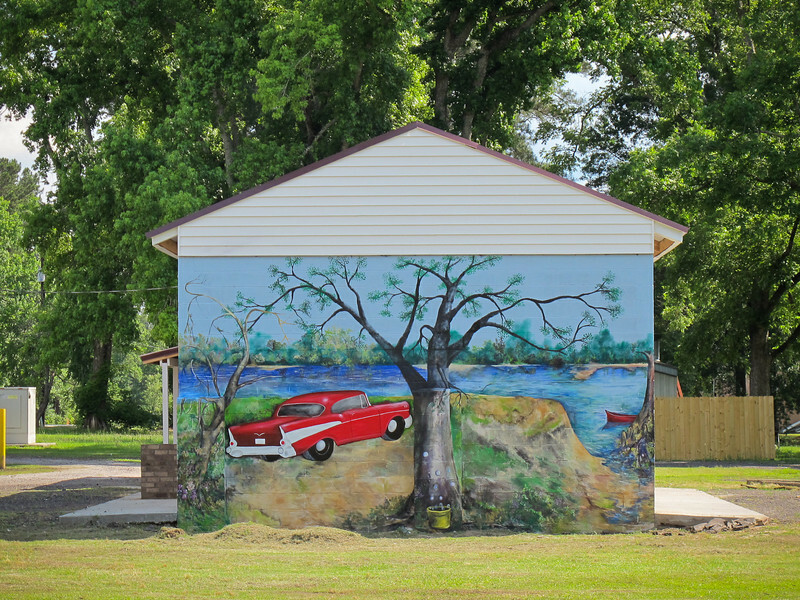 Artists need to take a quick picture of their work because another car full of aspiring artists can pull right up behind them and paint right over it. I kinda hope this lasts through the weekend, don't you? Interested in painting the boat? Caroline shares some tips in This is My South. 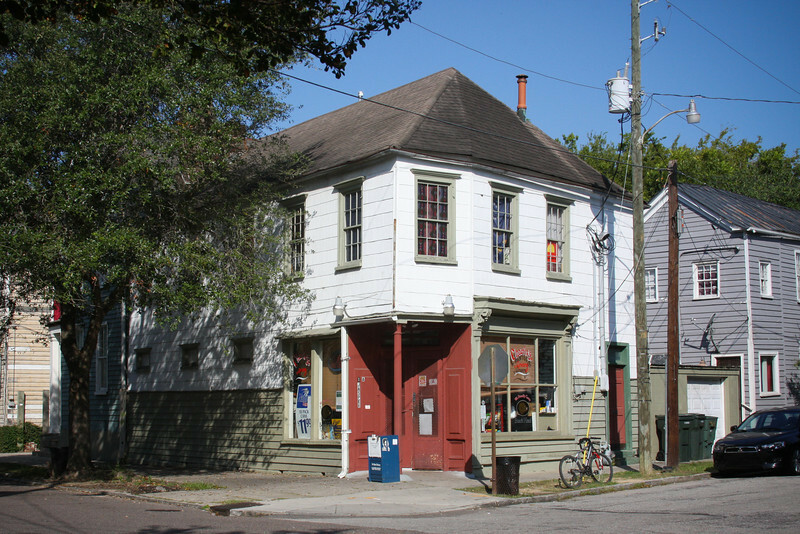 Bull St. Gourmet - Bull St., Charleston, S.C. I had to note that this Bull St. Gourmet is on Bull St. because the newer one where I liked to hang out halfway through my evening walk to enjoy my roasted portobello sandwich and a glass of wine is on lower King St. 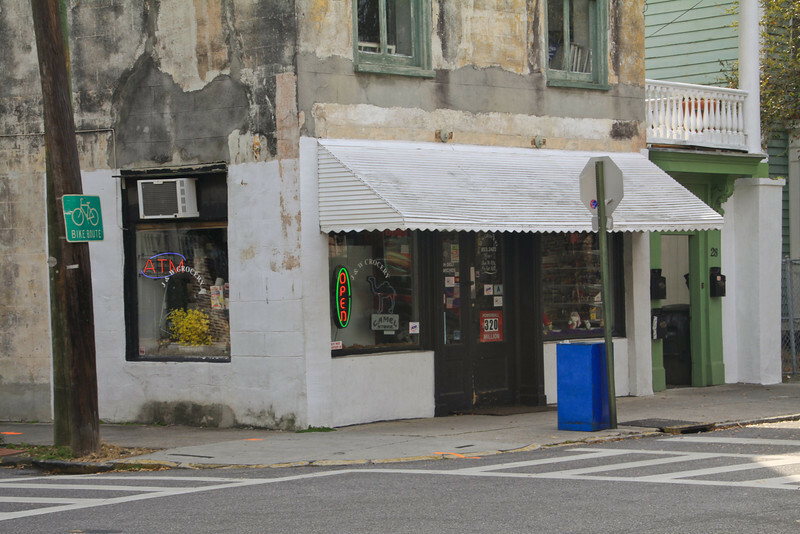 These little corner stores and gourmet grocery stores are one of the things I do miss about living on the peninsula. I love it that we do still have some character spots. This week has taken the wind out of my sails. The weekend is so close I can almost taste it. Yum. What movie shall I go to?